What’s the difference with Low Heat lightbanks? Low-Heat lightbanks are designed for LED and Plasma fixtures that do not output as much heat compared to Tungsten or HMI. The key advantage of a Low-heat lightbank is that the are dimensionally the same as their traditional Video Pro, Daylite Jr. or Quartz lightbanks. Low-Heat banks included 1/8 Grid diffusion screens and inner baffles, instead of Full Diffusion. This lighter weight diffusion material is designed to compliment the output power of many LED and Plasma fixtures as well. Low-Heat lightbanks offer lighting professionals a familiarity of light shaper, but with materials that are optimized for Low-Heat luminaires. 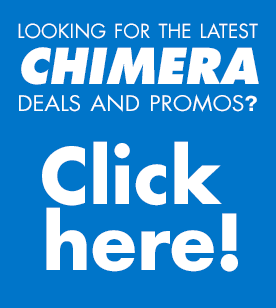 https://chimeralighting.com/wp-content/uploads/2017/08/chimera-lighting-logo-copy.png 0 0 Chimera Lighting https://chimeralighting.com/wp-content/uploads/2017/08/chimera-lighting-logo-copy.png Chimera Lighting2017-02-21 07:38:502017-07-03 13:37:17What’s the difference with Low Heat lightbanks? What banks can I use on the TECH Multi Bracket? Lens Screens vs. Standard Cloth Diffusion?